For those who have the ability to choose the dates of their holidays or for those who want to escape for a weekend in Tuscany recommend you visit the area between Volterra and San Gimignano. Located in a strategic area along the Via Francigena , San Gimignano is famous for its towers, ancient symbols of power of the families of traders who populated it during the Renaissance . The convenient location made it back then one of the most important commercial hub of Tuscany , consecrating the history of this corner of paradise ! 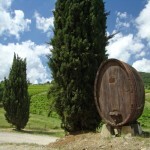 The development of tourism and wine production will decree the current fame. The historic center that develops within the ancient walls , is full of narrow streets and small shops of handicrafts and local products. If you have the good fortune to visit in autumn you can enjoy the view of Piazza della Cisterna free from the mass of tourists that invade from May to September . Numerous restaurants and farmhouses where to eat and endless choice of B & B , villas and apartments with swimming pool where you can stay . Outside the walls of the town of Siena is a succession of vineyards , wineries and dairies , taking any of the country roads is easy to find companies that offer tastings of wines or cheeses, it is cheap with rustic presentations to the ” peasant way ” that at high prices in the most refined . To the west of San Gimignano along a scenic route where are located most of the Ancient noble Tuscan Estates we reach the majestic city of Volterra. cheap farmhouses in Tuscany, boutique hotels , villas with pools and quaint B & B to make your holiday in Tuscany an unforgettable experience !